Our dating experts collected witty, spunky, and cutesy quotes uttered by or about lesbians in TV shows, movies, and real life. From tender to silly, these sayings are sure to make you smile. Ellen DeGeneres seems to never run out of funny things to say, but, in this quote, she turns sappy sweet as she explains how she feels about her wife, Portia de Rossi. With laughter and adoration, they complete each other. Ellen DeGeneres and her wife, Portia, are pictured here on their wedding day. Ellen and Portia make single girls everywhere laugh, sigh, and wish for a relationship that adorably lovey-dovey. Poor Piper. She’s drawn to Alex like a moth to a flame in “Orange is the New Black.” Their connection, at least in the television series, is full of passion, devotion, and more than a little physical attraction. “I was there for Alex,” she says about their criminal past. Whether she’s 23 or 32, Piper Chapman falls hard for Alex Vause every time. In 1996, the movie “Fire” highlights a forbidden relationship between two married Indian women. In this quote, Sita explains how their relationship defies society, law, and even language, setting their blood on fire. In “Buffy the Vampire Slayer,” Tara Maclay and Willow Rosenberg’s loving partnership is just too adorable. From candlelit confessions of love to fighting demons, these witches bring out the best in each other. In 1999, the Buffy TV series shocked viewers by showcasing a loving lesbian relationship. From 2004 to 2009, “The L Word” television series provided a scintillating look at a group of lesbians living in L.A. The show often dealt with homophobia and sexuality with nuance and humor. In season one, episode 16, a sheriff pulls over Tim Haspel and treats him to his theory on homosexuality. In 2013, “Blue is the Warmest Color” explored a heart-pounding romance between two young women. Emma, a free-thinking lesbian with blue hair, begins a love affair with Adèle, and both are transformed by the relationship. Marina Ferrer from Showtime’s “The L Word” just has that draw about her. She has girls wrapped around her finger. “It’s her gift. I don’t blame you for falling in love with her,” Francesca Wolff explains to a confused Jenny Schecter, who’s currently caught in the web of infatuated love. This quote comes to us from the collective wisdom of Pinterest. The stereotypical “Prince Charming” is outdated. Nowadays, we know that the love of your life doesn’t have to wear boots and a cheesy grin. Eat your heart out, Disney. These princesses rescue themselves from the tower. Your one true love doesn’t have to pop out of a storybook. She just has to make you happy, and that’s charming enough. Maureen Johnson and Joanne Jefferson, a high-tempered lesbian couple in the play “Rent,” don’t always see eye to eye, but their passionate relationship endures every fight. Even though “there will always be women in leather flirting with me,” as Maureen says, these two divas are no less devoted to one another. Trust author Elizabeth Gilbert, who penned “Eat, Pray, Love,” to come up with a quote about her lesbian relationship that melts the heart. In coming out as gay and announcing she’s fallen in love with Rayya Elias, her best friend of 14 years, Elizabeth spoke with emotional honesty and passion. Rayya is “my most trusted confidante. In short, she is my PERSON,” Elizabeth wrote in a Facebook post. Tig Notaro finally realized the importance of marriage when she fell head over heels with her now-wife Stephanie Allynne. She told The Guardian Stephanie melted her tomboy heart. Together since 2013, the couple raise twin boys and spend as much time as possible in each other’s arms. When heterosexuals try to apply their language to lesbian love, they miss the point. Pinterest came up with this beauty of a quote to push back against straight definitions and gender archetypes. Some lesbians are butch, some lesbians are feminine, and everyone else can deal with it. 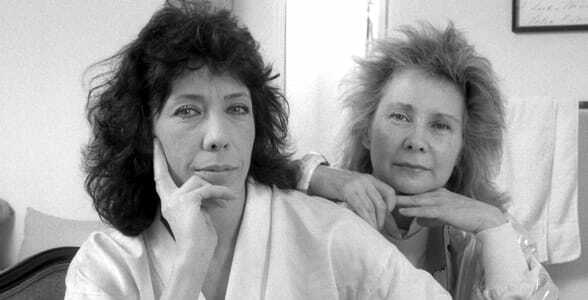 Actress Lily Tomlin and screenwriter Jane Wagener were in their 70s by the time gay marriage was legalized, so they viewed the idea of getting married with a wry sense of humor, quipping they may dress up like chickens on the big day. An actress and writer duo, this power couple have been working and living together since 1971. After 42 years together, on New Year’s Eve 2014, the couple finally tied the knot — probably not dressed like chickens. We hope you enjoyed these quotes about lesbian relationships. From sentimental to sassy, these famous lesbians offer a rainbow of perspectives on romance. Whether you want something sweet to say to your partner or simply a quick reason to smile, our 13 cute lesbian quotes have got you covered.